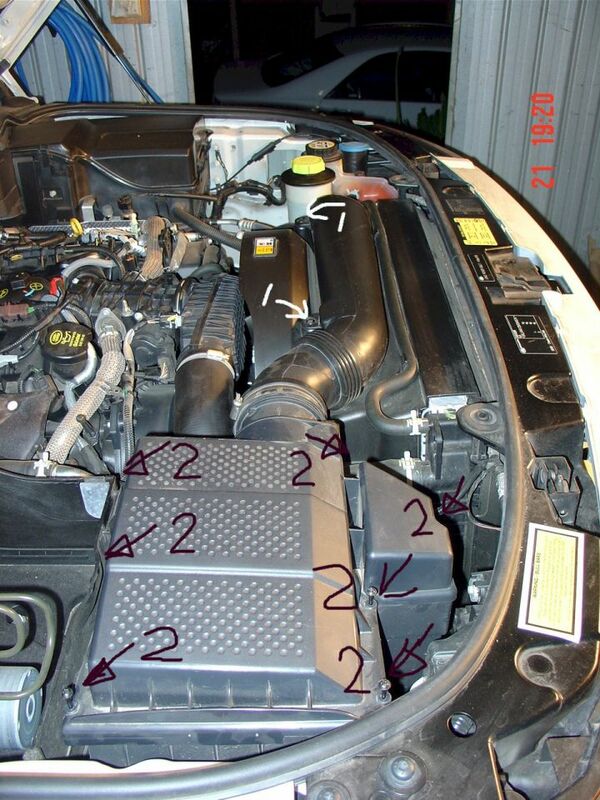 I was looking for some information on how to change the air filter on my TDV6 and couldn't find anything that explains how to do it. I was a bit puzzled by the fact that the actual air filter housing is screwed in place. The air channel that comes off the air filter seemed all very rigid and it wasn't obvious how the lid of the air filter housing would actually come off. I am sure most of you would have worked it out by now and this post is really for those paranoids (like me) who don't want to break anything. Step1: Use a 8mm spanner to undo the two No1 screws. You need to remove them all the way and put the in a safe place. Step2: Use a philips head screw driver to remove the 7 No2 screws. These do not have to be removed all the way. Just undo them until they seem loose. They remain in the lid. Step3: Simply lift the whole lid with air channel. In the picture you can see I was able to do this with one finger. That's it's. 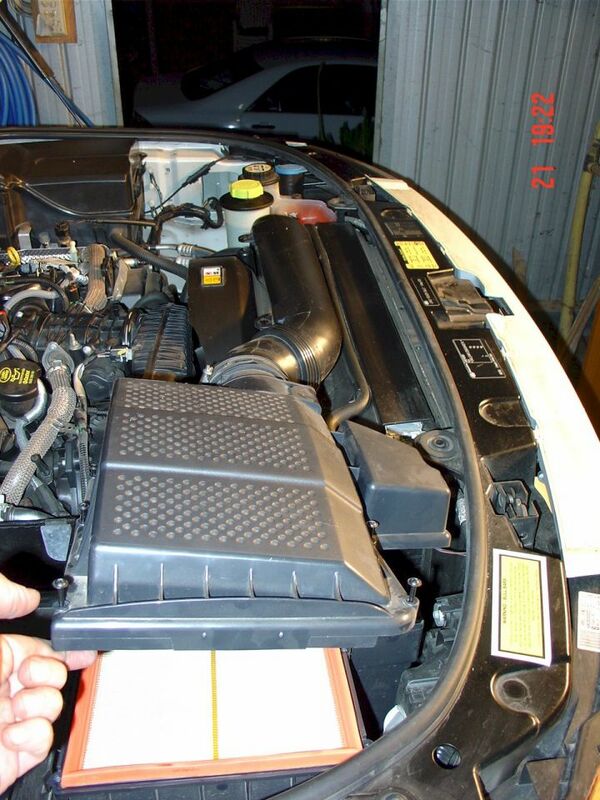 Now you can take out the air filter and clean it or replace it. Undo the steps in reverse order to complete the job. How do you clean your air filter? Just some compressed air or do you wash? I just use the air compressor and a vacuum cleaner with nozzle. Just remember that if using compressed air, keep a reasonable distance so you don't perforate the filter and always 'blow' the air through the filter in the reverse direction to how it normally works. Also if you're going to vacuum it, only vacuum the 'dirty' side, never the 'clean' side. If you don't do the above, you'll end up either pushing or pulling some of the dirt particles (dust/sand etc) to the clean side of the filter. I found if I don't undo no1 screws that I can't lift the lid as easily. So, I continue to undo no1 screws. Perhaps it's due to my model. I am driving a 2005 model. Saving fuel, not detailing. In Australia the dirt on the dirt roads can be finer than talcum powder (>32 micron). It gets everywhere inside the cab with everything shut and can really clog up an air filter. It's a very common practice in Australia to clean your air filter. Just reviving this thread a bit. Regarding cleaning the filters... In dusty environments what happens with pollen filter - is it able to keep the dust away from the cabin? And how easy it is to clean/replace? Once again a great guide! I know most folk will see this procedure as an eyes wide shut task, for those of us with a propensity for turning even the simpler jobs into a marathon session, it is perfect! Tonka truck goes in for it's lifeblood change tomorrow morning (decided on castrol Magnatec fully synth. as recommended here), will see how TT runs after, so that just means poss. gearbox flush from D-M when I find a piggy-bank to rob........and then there are new mudguards AND the mods, led lighbulb changes all round, badges, headlamps, taill lamps, . . . . . . . . . . . . . siiiiggggghhhhhhh! Lol. And don't forget to change the filter every year. Not every 3 years as LR thinks you should. Is there much benefit with these "carbon" filters?